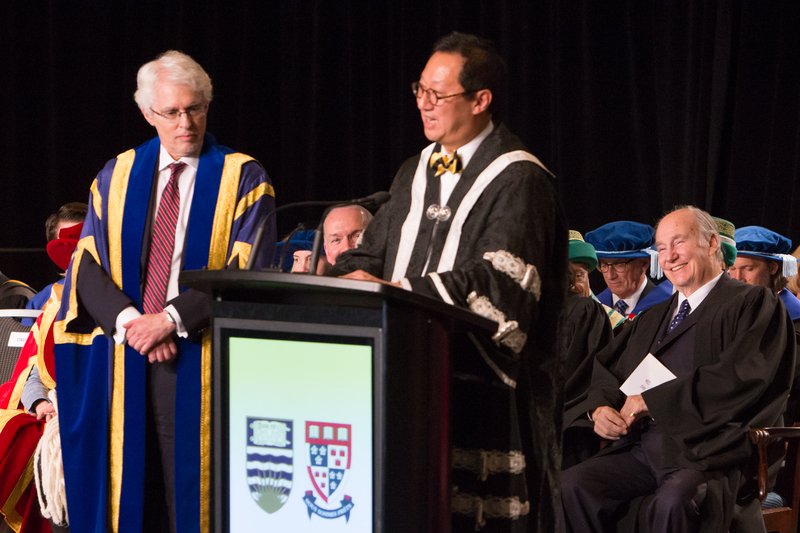 Professor Santa Ono, President and Vice-Chancellor of the University of British Columbia delivers part of the citation in honour of His Highness the Aga Khan, as Professor Andrew Petter, President and Vice-Chancellor of Simon Fraser University looks on. The two universities each conferred an Honorary Doctor of Laws on His Highness the Aga Khan in an unprecedented joint ceremony. I am deeply honoured today, with my esteemed colleague, SFU President Andrew Petter, to welcome and present His Highness the Aga Khan IV, Imam of the world’s Shia Ismaili Muslims. We are gathered today to confer honour upon His Highness. Specifically – and for the first time in our two institutions’ history – we are here to confer honorary degrees from both of our universities. The honorary degree is the highest honour that a university can bestow, one that recognises the accomplishments and contributions of an exceptional individual. In honouring a candidate of eminence and excellence, we also offer a public illustration of our own values and ambitions. We do so to inspire our graduates and our community. To this end, I can think of no candidate who so deserves this unprecedented joint recognition than His Highness the Aga Khan. Who, in that regard, could be a better exemplar than His Highness the Aga Khan? The Aga Khan Development Network – the AKDN – works in more than 30 countries. Operating roughly 1,000 programmes and institutions, it employs more than 80,000 people and invests more than US$1 billion, every year, in non-profit development activities. This is a profound example of global citizenship, and one that is inclusive of race and ideology. The AKDN is guided by the ethical principles of Islam, particularly consultation, solidarity with those less fortunate, self-reliance and human dignity. But the Aga Khan’s leadership is not restricted to a particular community, country or region. Rather, the AKDN focuses on the poor and vulnerable – although, as many UBC students and graduates can attest, it also supports programmes in Europe and here in North America. Working with every religion, race, ethnicity and gender, pluralism is a central pillar of the AKDN’s ethical framework. We are all, again, inspired by his example. His Highness Prince Karim Aga Khan is the 49th Imam of the Ismaili Muslims. In that role, he is the spiritual leader of the 15 million Ismailis, a multi-ethnic community dispersed among more than 25 countries, including South and Central Asia, Africa, the Middle East, Western Europe and North America. There are more than 100,000 Ismailis in Canada alone. Renowned for the good works of the AKDN, the Aga Khan has demurred when people call him a philanthropist. He says, rather, that his mandate requires that he use the office of the Ismaili Imamat, which he inherited to improve the quality of life for the world’s most vulnerable. He presents his work not as an act of generosity but as the exercise of his responsibility. If we all took the same view in our own lives, it would be such a better world. Born Prince Karim Aga Khan, in Geneva, Switzerland, on December 13, 1936, the Aga Khan is the eldest son of Prince Aly Khan and his first wife, the Princess Tajuddawlah. It is believed that the Aga Khan is a direct descendant of the Prophet Muhammad, through the Prophet’s daughter Fatima az-Zahra and her husband, and Muhammad’s cousin, Ali, who was the first Imam in Shia Islam. The Aga Khan spent his early years in Nairobi, Kenya, where he began his education under private tutelage before returning to Switzerland and boarding school at the Institut le Rosey. He then studied Islamic history at Harvard University, where he graduated 1959 with a Bachelor of Arts and a varsity H for soccer. As an athlete of accomplishment, he also competed on behalf of Iran as a downhill skier in the 1964 Olympics. In more than 60 years of service, His Highness the Aga Khan has proved the wisdom of his grandfather’s choice. I would now like to invite my colleague, SFU President Andrew Petter, to continue the Citation.